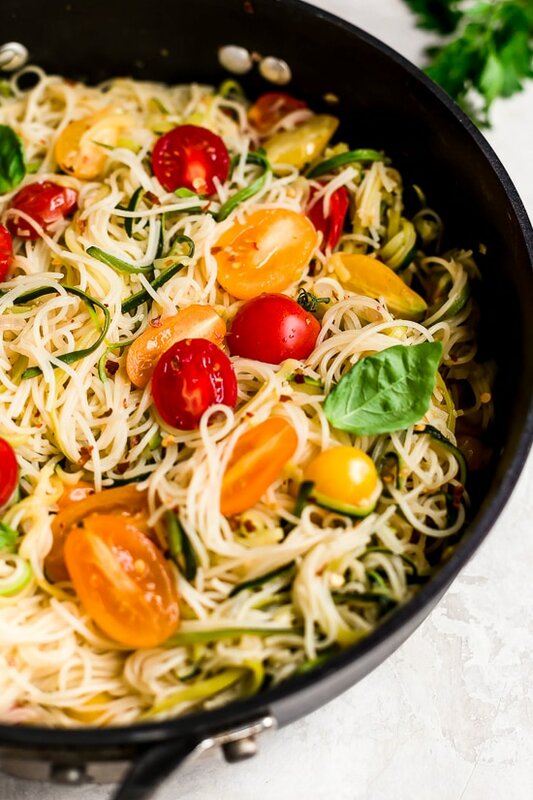 Angel hair pasta tossed with summer zucchini and tomatoes fresh from the garden. The perfect meatless meal you’ll be craving again and again. Serve this with plenty of Parmigiano Reggiano! 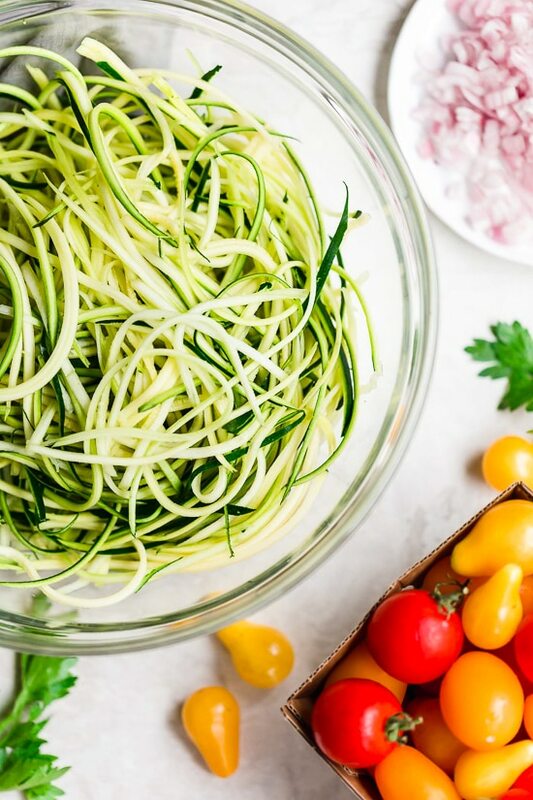 I love combining spiralized zucchini with pasta, it’s a great way to lighten a pasta dish, and you’re still getting real pasta which I often crave when I am eating zoodles alone. This recipe is an oldie from my site, it’s a dish I often whip up in the summer and it’s great because it takes less than 20 minutes to make. For those on gluten-free diets, use brown rice pasta instead. 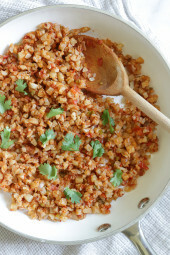 I love this simple weeknight meatless dish, if you wish to add protein, this would be great with shrimp or chicken! 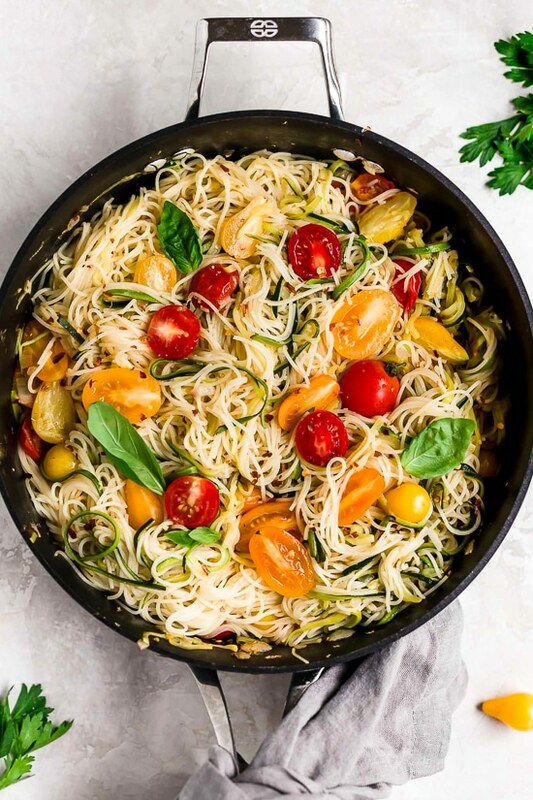 Angel hair tossed with summer zucchini and tomatoes fresh from the garden. The perfect meatless meal you’ll be craving again and again. Serve this with plenty of Parmigiano Reggiano! In a large pot of salted boiling water, cook pasta according to instructions. While pasta is cooking, in a large saute pan, heat pan on medium-high flame, add oil when pan is hot. Add garlic and shallots to the pan and saute about 1 minute, until soft. Add zucchini and season with salt and pepper. Cook about 1 1/2 minutes, add tomatoes, crushed red pepper flakes, parsley, chicken broth and adjust salt and pepper. Stir and cook for 1 more minute. Drain pasta when done reserving some of the water and and toss the pasta well with zucchini and tomatoes. Add pasta water if needed and serve with grated Parmesan (optional). I tried this tonight with shrimp and it was excellent! Thanks so much! Far exceeded my expectations! I added a lot of crushed red pepper, added kalamata olives and subbed better than bouillon and pasta water for the chicken broth. So amazing! The servings were so substantial, my husband couldn’t even finish his. Highly recommend! Another amazing meal. So easy, but flavorful. Loved this just as is!I am not a red pasta sauce fanatic anyway so this hit the spot!Probably ate more than one portion but it was so good.I am following all your recipes for one week and I find it easier that you provided the shopping lists.Thanks for that!Makes me realize how good it is to eat right again! This looks so good! What spiralizer did you use? I need to get a good one! Gina, I recently had a Cauliflower Fritti appetizer from All Purpose Pizza (DC.) It was roasted cauliflower, Sicilian hot sauce, mint, caper yogurt, topped w bread crumbs. If you could recreate a similar recipe I would really appreciate it. It kind of tasted like a Cauliflower buffalo wing but with an Italian twist, really liked it. I love this recipe! 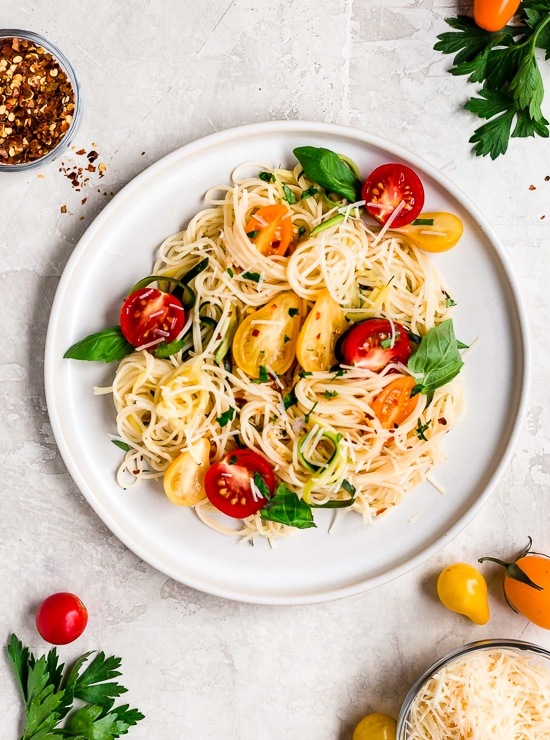 I use the chicken (bone) broth and really like the flavor it adds it really compliments the fresh zucchini and tomatoes and with a little brown rice pasta and a sprinkle of parm it’s kind of addicting. I make it quite often. Thank You! Question: Is it 2 zucchinis for 7 oz total or 2 x 7 oz zucchinis for a total of 14 oz? Thank you! This was soooo good! The only thing different – no oil or broth and I decided to add half of a packet of dry zesty italian dressing. Would definitely make again. This has become one of my go-to sides! So delicious! I made this tonight for the first time. It's delicious! I used grape tomatoes because that's what I had and I added corn because my kids like corn. Thanks for the yummy recipe! I think I will try this and add a can of clams to the pasta. We've been serving this with chicken we marinade and then grill. We chop the raw chicken into small chunks sized for skewering, and marinade them for at least 8 hours (it usually ends up being for 24 hours around here). Skewer 'em up (don't forget to soak your skewers if you're using wood!) & throw them on the grill until cooked. We then serve the chicken on top of a pile of the pasta. It's a fantastic combination! Gina, I have yet to eat anything from your blog that isn't fantastic!!! Made this for dinner and it was absolutely delicious! Your blog has truly helped change how my family eats, as well as to help shrink our waistlines! I can't believe I used to eat a lean cuisine for dinner each night for years!! Never again. Thank you for the wonderful recipe! I made this last night and my husband and I both LOVED it! Food texture seems to be important to me, and I really like zucchini and carrots as a side dish cut julienne-style. Plus, I needed to use up some of my tomatoes and zucchini from our garden. Using zucchini cut like this and combining it with pasta is a GREAT idea. The zucchini was still a little crunchy which I love. I will definitely make this again. Thanks AGAIN, Gina, for helping me on my WW journey and my new goal of trying to be healthier! Its saying its 8 pts for the whole 8oz of pasta. 4 pts for all 4tsp of the olive oil. The rest of the items are zero pts. It saying its 20 pts for the whole dish 20/4 is 5pts. Perhaps I am doing it wrong, but that is what it says. So glad you all loved it as much as I do! This was amazing! I made this for my family and they loved it. The sweet of the tomato with the spicy red peppers was a perfect combo. I ribboned the zucchini and it was a big too long for my taste, but chopped up easily with a fork. Overall, it was a great summer dish, thanks so much! Add us to the 'this is incredibly awesomeness' crowd! My kids gobbled it up too! I can just think of a million and one ways to tweak this…add grilled shrimp…use white wine instead of chicken broth…drink white wine with it…eggplant added? Thanks a gazillion! So I literally just rinsed my dish and put it in the dishwasher after having this tonight. I did make a bit of a change – today, I'd cooked up chicken in the crockpot so I could shred it. So for this recipe, I used half as much zucchini, and replaced it with some shredded chicken. After sauteing the shallot & garlic in half the olive oil, I tossed in the chicken and left it in the pan just long enough to get warm. Set that aside, put the rest of the oil in the pain and in went the zucchini. Once I'd added the tomatoes, broth, parsley & red pepper flakes, I put the chicken/garlic/shallot mixture back in. This is shooting straight up to the top of our "favorites" list here at home. AMAZING!! I have made this dish twice and I love it. The first time I made it I followed the recipe exactly and was not disappointed. The second time I made it I added some large chunked jumbo shrimp. Absolutely delicious. I have made several recipes from this site and I have never been disappointed. Thanks Gina for some great recipes!!!!! This was so delicious! I think we have tried at least 10+ different recipes from your website and we have loved every one of them. I really think you need to make a cookbook! do you measure the pasta before it is cooked?! Usually 1/2 box if your box is 16 oz. I found your recipe yesterday and cooked the dish for supper.it was superb! Thank you very much! Ok, so I made this last night and it was so yummy and "refreshing" if that could be the right word. My husband's one complaint about eating healthy like this is that he misses meat! SO…a side of sausage for him to add to his bowl and it was perfection in our house!!! Thank you for making eating enjoyable again! Delicious! I neglected to look at my bottle of pepper flake as I 'sprinkled' them on, I dumped about a tablespoon on lol washed off as much as I could but I'm breathing fire tonight. Thank you, Gina! This was delicious! Hi Gina, I noticed there isn't an amount for the parsley listed in the ingredients. How much do you recommend? FANTASTIC! made this tonight for meatless monday! youre recipes never fail! I have all of the ingredients, so I am making this for dinner tonight :). Another gluten free option… prepare with spaghetti sauce instead of rice pasta. That's what I plan to use. We have been using spaghetti squash in place of pasta since diagnosed with gluten intolerance. Results in less points, too! I picked a zucchini out of my garden today! (no tomatoes yet). Going to pick up a tomato at the store! This will be lunch for me today! YAY! Great way to highlight one of my own grown vegetables. A healthy summer pasta! Love it! I made something very similar last night and was thinking about how it would be a great recipe for you. Used LOTS of zucchini and summer squash, 4 roma tomatoes, garlic, salt and red pepper to taste, scallops, all served over angel hair. This looks soooooo delicious. THANKS. NEW Google Follower and I follow you on Bloglovin'. I'm growing summer squash (yellow variety)- do you think I can sub this for the zucchini. I've got vine ripe Creole tomatoes ready to go! Is it weird that it's 4am and I would love to have this to eat right now? Wonderful dish!! Thanks for reposting. I'm new to your blog and appreciate your recipe. It looks delicious! Great presentation! 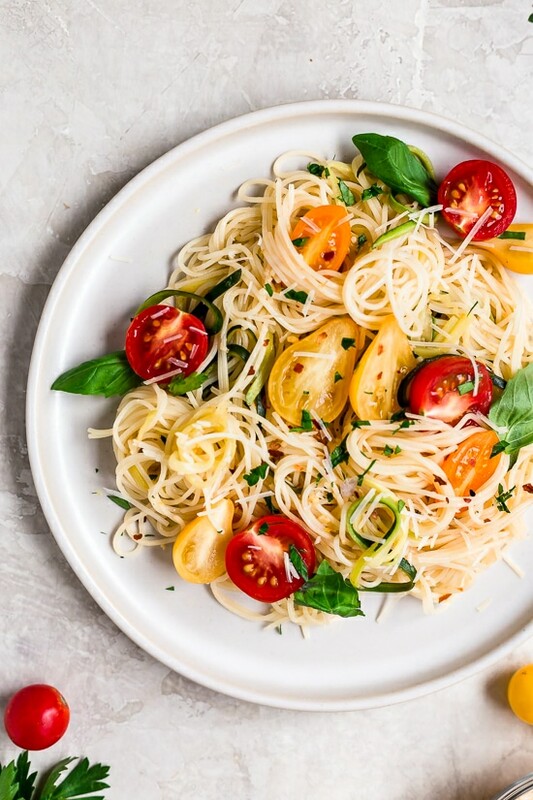 This looks like a PERFECT summer pasta dish. I need to make this! YUM! This looks so simple and good! My boyfriend and I have been meaning to try a pasta dish without any sort of tomato sauce (it gets boring after a while). Thanks for the recipe, definitely going to give this one a go soon! I love this. Will have to give it a try. Thanks so much for sharing. This looks delicious! I just got home from the grocery store, too bad I didn't buy all these ingredients!!! I made this recipe tonight and LOVED it! The meal was healthy and filling; fresh and tasty! 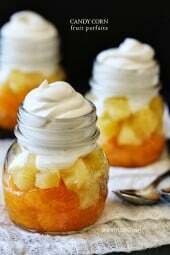 Great recipe and so easy to make. My mother fell head over heels for this dish! 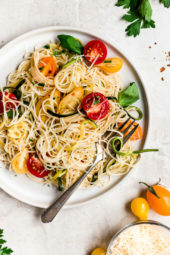 I make it for her everytime she comes over, I used grape tomatoes the first time i made this (cause thats what i had around) and OMG they make all the difference! Loved this! We had it as a main dish tonight with a salad. I did put a squeeze of lemon on mine for a little acidity since I don't do tomatoes. I also used something called a tender grey zucchini. The recipe says to serve with grated parmesan cheese. How much per serving or total and is this amount included in points+? Thank you. Your website makes me want to lose weight just by looking at it. It is very well set-up! If I am making this for a big group of people how much do I measure myself? 1 cup, 1.5 cups, etc. Because I am making this dish for about 15 people, therefore I don't know how to measure my serving. This was awesome…I accidently messed up and dumped the whole box of pasta in, then was in another world when I mixed it together (I had told myself that I would only use half the pasta), but had I not messed up it'd have been the best meatless pasta I've tried!! Thank you Gina!! God question, I probably picked up from another recipe and forgot to change that. The serving size is 1/4th of the recipe so it's divided equally by 4. A little over a cup approx. Served this last night with some grilled grouper – it was delicious and a hearty portion! I didn't have fresh tomatoes so added about 3/4 can of fire roasted tomatoes and also added a few spears of asparagus. I came up with about 6pp – will definitely make it again! This is a good one!! Since I always have to come up with new recipes, it's hard for me to make repeats of older ones. Tip- Don't overcook the pasta and it should be great! Send me an email and I will give you the button! Gina, YOur blog is a lifesaver!! The pictures are beautiful and everything I've made so far (5-6 things) has been absolutely delicious. I'm so grateful for your willingness to share your recipes and ideas!! Agreed. Your recipes always taste restaurant quality. I tell my husband all the time that we don't need to eat out, I'll just make a Skinnytaste meal. Thank you so much Gina. Made this tonight and couldnt believe how much food I got for such a low point value! So yummy! Tomorrow night is the crock pot chicken taco chili followed by the skinny chicken parmigana! Thanks for sharing and glad you like them! Yes, I guess in the back of my mind I have considered making a cookbook, but not sure where to start! Maybe one day. Thanks for the compliment. Yay! Thank you for following your dream! You have made this first-time mom’s meal planning & grocery shopping life much easier and healthier, too! It’s fun reading these old comments – you have THREE cookbooks now! I have made several zucchini recipes this week and also passed your website off to a fellow friend on WW. Everything looks delicious AND easy! Have you considered a cookbook? Pictures and great recipes equals a WINNER in my book. The serving size is basically dividing this equally in 4 bowls. I figure out the points for the whole recipe, then divide by servings. If there is a better way, let me know. I LOVE this site!! This is my first time here I have lost 98 lbs on ww but have started to fall off the wagon this site has gotten me excitted again. Only one problem what are the serving sizes of this dish? I make this ALOT with fresh baby spinach leaves or with fresh steamed asparagus and the family LOVES it. 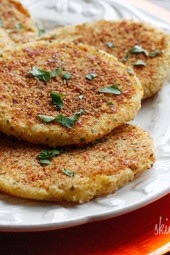 I hadn’t thought to use zucchini but I am so gonna try this! It’s budget friendly. I also use whole-grain pasta, mostly penne (the kids enjoy the different shapes) so I vary it. Looking forward to this recipe!!! This is an exellent site it looks good,I expect it tastes even better, unfortunately licking my monitor tells me nothing Aww I wish I had smelly vision.nice work.